Northern Ireland has a troubled history and for some time I, and you too, probably heard about it only in the news when they talked about violence and conflict. Violence dominated the news, but now, Northern Ireland has stabilized and can now show how beautiful and amazing it is! 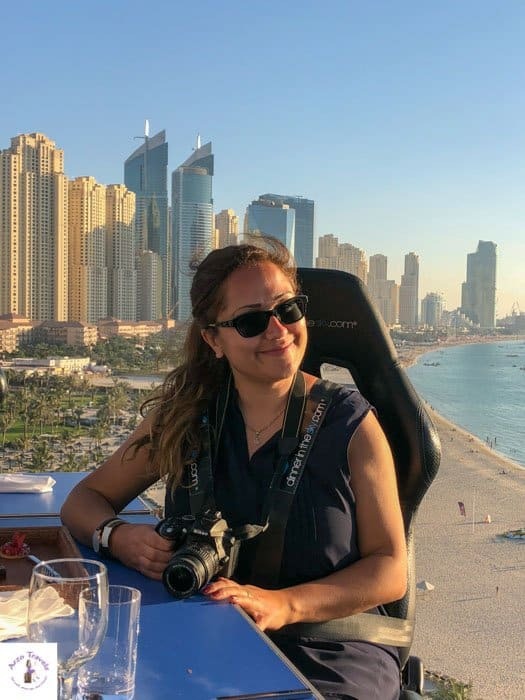 My fellow travel bloggers have shared their top recommendations for the best places to visit in Northern Ireland and the best things to do in Northern Ireland. 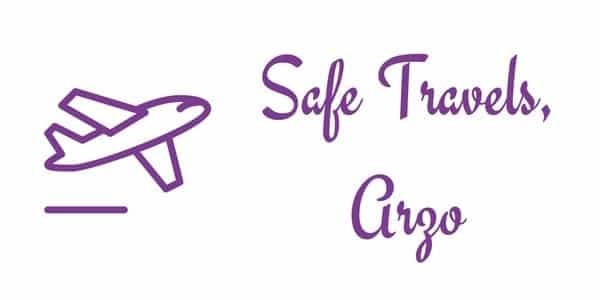 Okay, here they are the best places to visit and the top things to do. The first thing that comes to mind when thinking of what to see in Northern Ireland is the stunning landscapes of the Antrim coast and the Giants Causeway, or even the ‘Game of Thrones’ locations. But if you are thinking of where to go in Northern Ireland you should definitely not miss a visit to the capital city, Belfast, which is the birthplace of the famous RMS Titanic and is chock full of the best places to go in Northern Ireland. If you have watched the epic movie ‘Titanic’ and would be interested in some behind the scenes information, you can visit the location of the shipyard where the Titanic was built. Explore more on the history and making of the Titanic in the magnificent museum building ‘Titanic Belfast Experience’ through its galleries and exhibitions. You can also choose to explore the Titanic Quarter, Titanic Dock, Pump House and more, on one of the walking tours, boat tours or on a Segway tour. A visit to the last remaining White Star Line ship SS Nomadic berthed next to the Titanic Belfast building is a one of a kind, unique experience. You can walk the deck and different parts of the ship and explore 100 years of maritime history making it one of the most interesting Northern Ireland attractions. 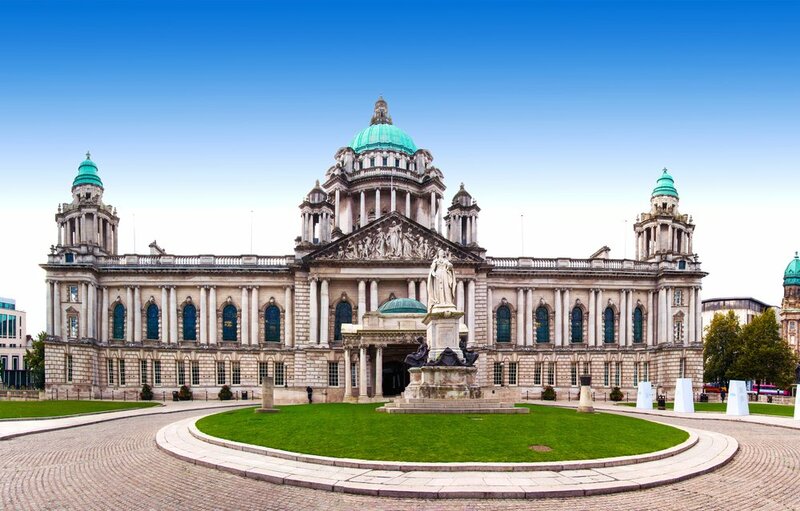 The beautiful city of Belfast also has numerous historical buildings including a Victorian-era prison, Crumlin Road Gaol, which can easily be explored in a day. To get other Northern Ireland tourist attractions such as The Giant’s Causeway from Belfast, it is only a couple of hours’ drive, so it makes for a great base to explore the picturesque locations of the country. One of the most fascinating Northern Ireland sights has to be the Giant’s Causeway. Giant’s Causeway, along with the surrounding Causeway Coast, is Northern Ireland’s only UNESCO World Heritage Site and is one of the most beautiful places to visit in Northern Ireland. 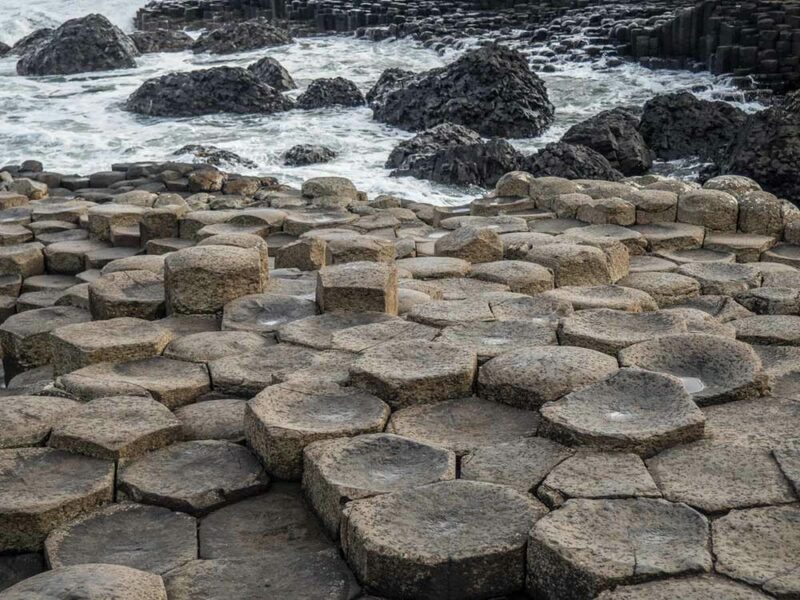 It’s a gorgeous natural landscape in County Antrim, formed by about 40,000 black basalt columns that stick out into the sea. This area has been an important part of Irish folklore, inspiring tales of Finn McCool protecting Ireland from the Scottish giant Benandonner. It has also been a highlight for tourists for centuries. Budget at least a few hours of time for your visit as it is one of the best tourist places in Northern Ireland. There’s a wonderful visitor’s center that has exhibits on the geology, tourism history, and the artwork of the Causeway, along with a café and gift shop featuring local goods. You can take a bus from the visitor’s center to the causeway proper, or you can walk on your own. Once at the causeway, you can explore the rocks, listen to an audio tour or take a walk with a guide, and try one of the longer coastal hikes. After visiting the causeway, there are plenty of other Northern Ireland points of interest to visit nearby. For more of the most beautiful places in Northern Ireland, you can drive over to Dunluce Castle, a stunning castle in ruins on the edge of a cliff overlooking the sea. 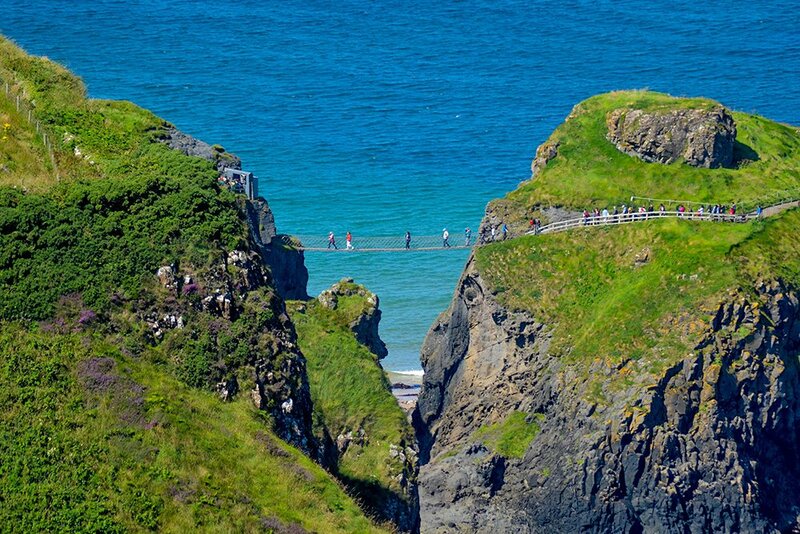 You can also check out the awe-inspiring Carrick-A-Rede rope bridge or drive to the Dark Hedges which was featured in Game of Thrones as the King’s Road. Giant’s Causeway can be done by itself as a day trip from Belfast or Londonderry, or you can plan several days in the area to explore and hike. Talking about Giant´s Causeway. 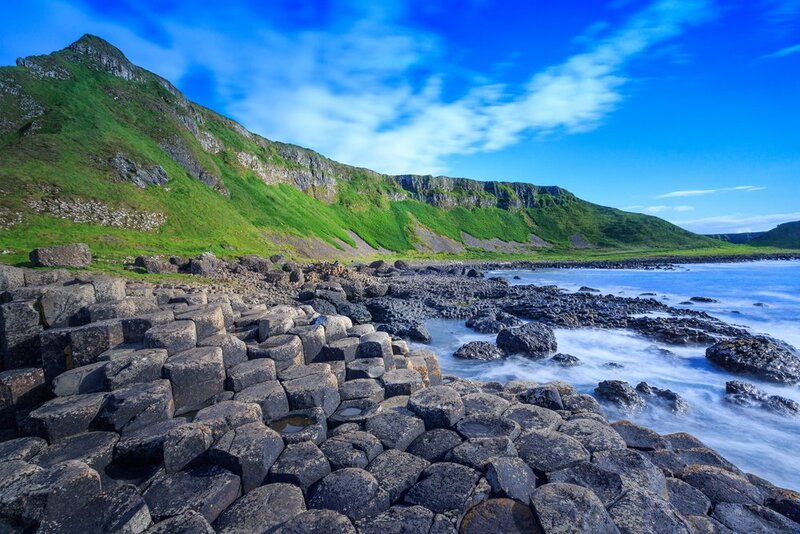 The Causeway Coast maybe best known for the Giant’s Causeway, but it is also home to many of Northern Ireland’s sandy beaches, iconic coastlines, and numerous tourist attractions dotted along the way. The coastline stretches from the mountainous backdrops and cliff walks of Cushendall, to the drive-on beaches and towering scenery of Mussenden Temple and Downhill Demesne. Along the way there are attractions of varied interest including ‘Game of Thrones’ filming locations, like Port Ballintoy, a cosy harbor village known as the setting for the “Iron Isles’, as well as the Dark Hedges which are just a short stretch inland. Even some views, such as the cliffside ruins of ‘Dunluce Castle’ look like they’re straight out of the fantasy franchise. There are also varying interests along the way, including Carrick-a-Rede Rope Bridge for the more adventurous, as it links the mainland to the tiny island of Carrickarede. Also a good area to stay would be the village of Bushmills, home to the famous Bushmills Distillery, where the tours and whisky sampling are a personal favorite. There are always varying tour options from Belfast to the Causeway Coast, although independent adventures are always more fun. 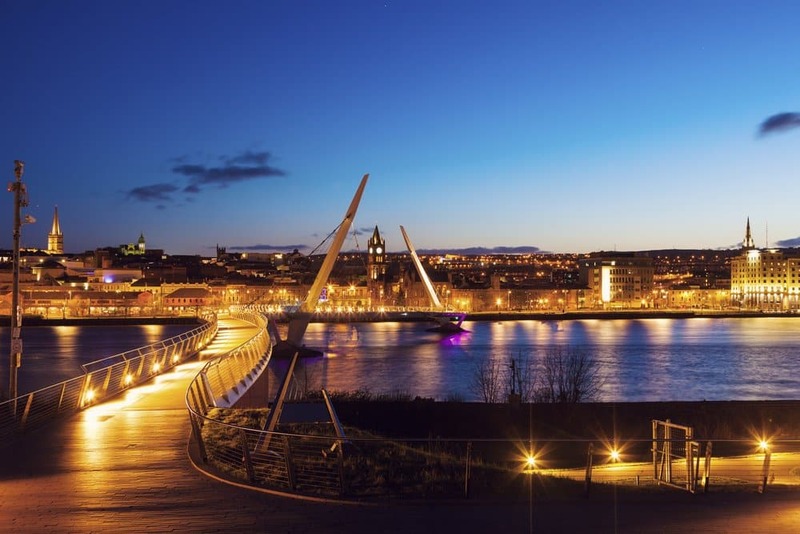 Of the best Northern Ireland destinations, Derry, the second largest city in Northern Ireland, is an artistic and cultural hub. Within the last several years, Derry’s center has been reinvigorated by a makeover in honor of its status as the first UK City of Culture. It has a bustling waterfront area along the river and new spaces for performances and outdoor festivals that give the city a constant energy. Its successful Derry City Football Club, numerous excellent restaurants, and developing live music scene keep things lively. There are also ample opportunities for shopping, including the copper-domed Austin’s, which claims to be the oldest department store in the world. Derry is also a city with a deep history. Its 17th-century walls that encircle the center are the best-preserved in all of Ireland and make a perfect place for an afternoon stroll. When it comes to places of interest in Northern Ireland, Derry has so much to choose from. There are churches, museums, and historic buildings telling the story of this great city. One of the most notable attractions, the Bogside Murals, visually depicts the struggles that were at the city’s heart for decades—the conflict between Catholics and Protestants known as The Troubles. The striking works of art that center around Free Derry Corner show the difficulties between the communities and some memorialize the lives that were lost. The nearby six-year-old Peace Bridge stands as a monument to a city coming together in growth and healing since the end of those turbulent times. If you’re wondering where to visit in Northern Ireland to learn about its political history then look no further than the Belfast Famous Black Cab tours. 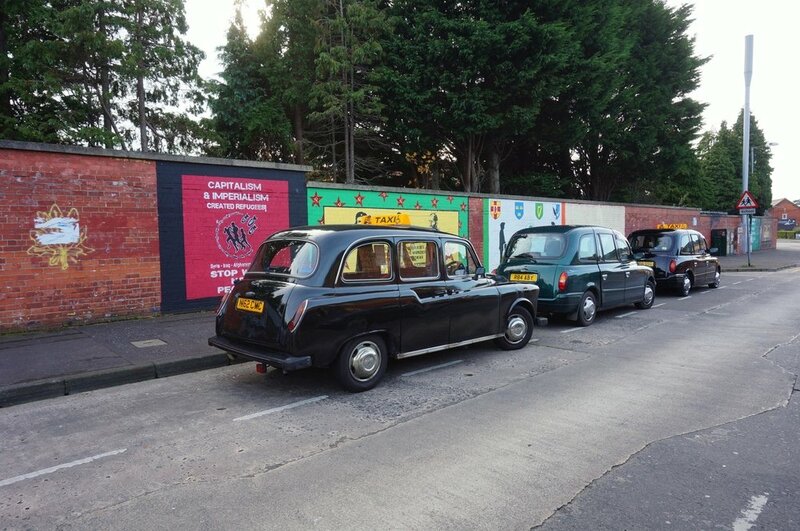 The Political Murals and the Peace Line tour offered by the Belfast Famous Black Cab tours is a must if visiting the Belfast area. Hurtling down the scarred streets of Northern Ireland in London cabs, you’ll learn the facts and stories about the conflict that ripped Northern Ireland apart for over three decades. Pointing out historical buildings and sights along the way, Paddy did a quick stop at the famous Peace Line for photos and signing of the wall. Our tour ended right back where we started. Yes, they will pick you up and drop you off, another nice feature of the Belfast Famous Black Cab tours. If political history isn’t your idea of fun, tour the land of Winter’s castles, caves, shorelines and The Dark Hedges from the Game of Thrones. Or see the wilds of Northern Ireland on the Beyond Belfast tour which includes the Giant’s Causeway and the Carrick a Rede Hanging Rope Bridge (both amazing). Or design your tour! Belfast Famous Black Cab drivers are not only extremely affordable but are open to customizing your tour any way you’d like. Just be ready to hang on because these guys don’t like to waste your money and will keep you thoroughly entertained while they drive at a break necked pace from point to point. We can’t think of a better way to immerse yourself in the history and beauty of Belfast! 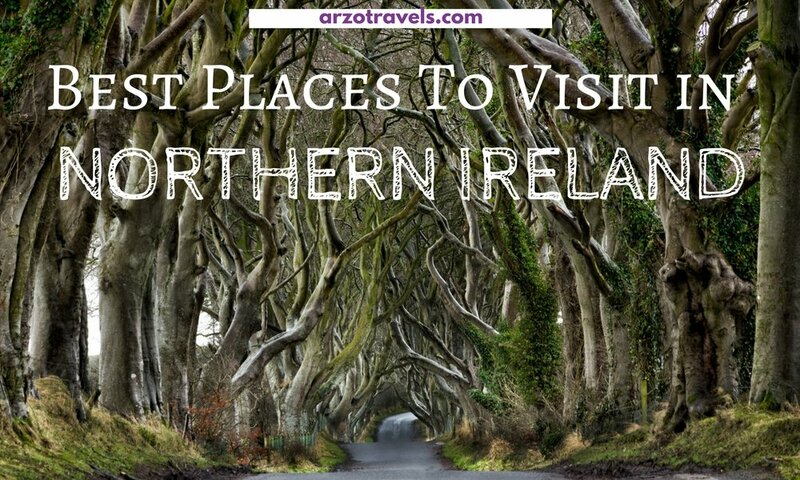 If you are wondering what to do in Northern Ireland and you happen to be a Game of Thrones fan, then this one is for you! One of the most fun things to do in Northern Ireland, besides visiting the filming locations of the series, is finding all the GOT doors. Back in 2016, the famous Dark Hedges (the filming location for King’s Road, when Arya escapes King’s Landing disguised as a boy in season 2) have been badly damaged by storm Gertrude, and many of the trees have been knocked down. Because of the success of the Game of Thrones series and how much it helped the tourism in Northern Ireland, the fallen trees have been used to create 10 doors, each representing an episode of the 6th season of the series. 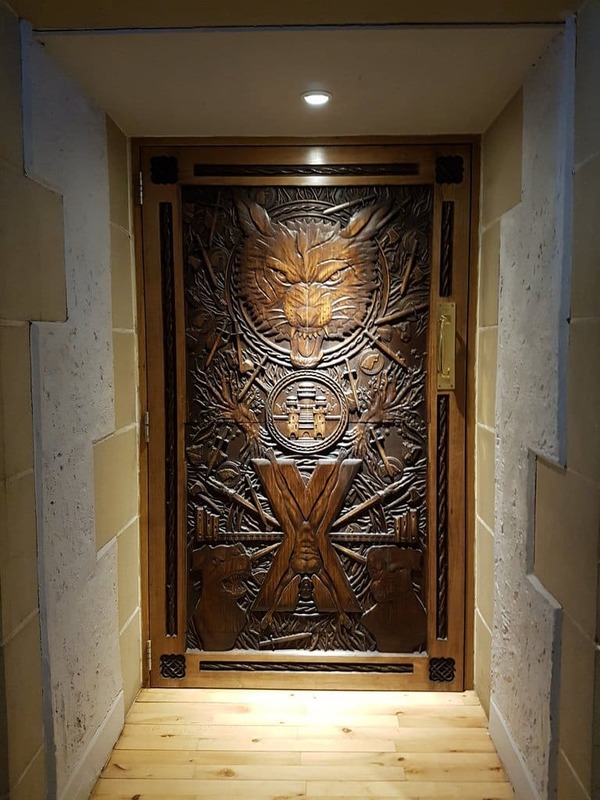 The doors have been carved with key elements of the episodes and hung across different places to visit in Northern Ireland including pubs and restaurants (and even inside a castle) close to filming locations. The location of each door has been unveiled one week at a time, together with the airing of the related episode of Game of Thrones. You can do a road trip to find all the doors and even download a passport from the Irish Tourism Board website, where you can collect stamps from each location visited. It’s a trip that every Game of Thrones fan should take! For the true Game of Thrones fans, there is one location in Northern Ireland that you don’t want to skip and that is Castle Ward, or perhaps as you know it: “Winterfell”. Located in County Down, this historic farmyard features as the “House of Stark” in all seasons of the series and while there is a lot of CGI used, when you are here you’ll definitely get a good sense of what the actors must have felt while shooting their scenes. 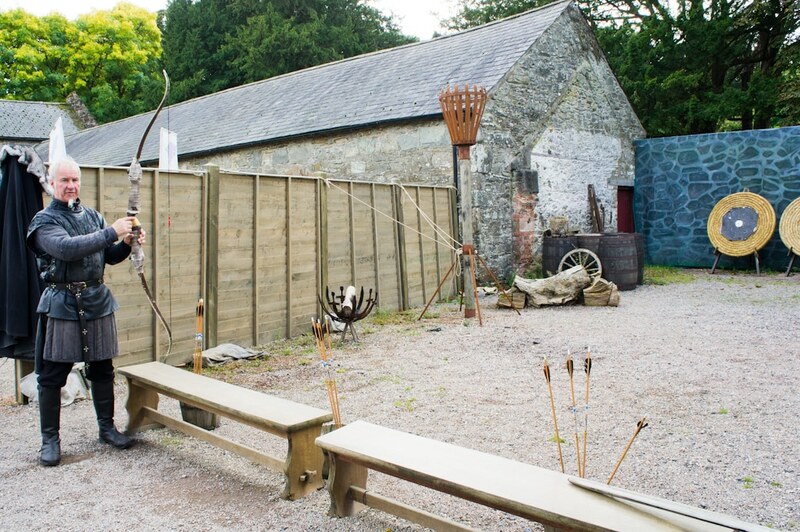 With the on-site “Winterfell Experience”, you get to step into the world of the characters as you dress up in Stark costumes and have a go at archery, or go on a bike trail to see some nearby shooting locations such as the “Whispering Wood” and “Robb Stark’s Camp”. You’ll even be back in time for a special meet-and-pet with a pair of beautiful “direwolves”! As you can imagine, these activities are very popular, so you’ll definitely have to book in advance. That said, access to the site and all nearby filming locations is open to everyone at normal admission rates of Castle Ward. Even if you’re not a Game of Thrones fan, I can still recommend a visit, as the building has a great mix of architectural styles and the surrounding area of hills and views over Strangford Lough are priceless. Follow the Lough Trail to spot wildlife and wildflowers and of course to soak up some fresh Northern Irish air! Rathlin Island is one of the lesser known attractions on the Causeway Coast, as it isn’t included on any tour option, and it must be done independently. But it is no doubt worthwhile considering, as it is relatively simple to reach, and can be taken on as a half-day tour. So Rathlin Island is reached by boat, where the Rathlin Ferry leaves from a small harbour on the coast of Ballycastle at regular intervals throughout the day. Check the Rathlin Ferry timetable here. The island itself is also relatively easy to explore, either by foot or bicycle rentals, and there is even a regular bus service to reach the further parts of the island. Scenic walks along the coastline find the remains of old stone houses, seals basking on rocks and beaches, although the highlight would be the RSPB Seabird Centre. This Seabird Centre opens from March to September each year (10:00AM to 17:00PM daily), and can be found at the ‘West Lighthouse’ of the island, where it overlooks some of the most magnificent cliffside views. Among these cliffs are some of the largest breeding seabird colonies in Europe, including puffins, guillemots, razorbills, kittiwakes, puffins, fulmars, shags and gannets. Grey Abbey is an evocative ruin dating back to 1193 built by Africa in the County Down area of Norrthern Ireland. Affreca was the daughter of the King of the Isle of Man and married to John de Courcy when she moved to Ireland. Affreca founded the Abbey to give thanks for a safe landing after a perilous sea journey. 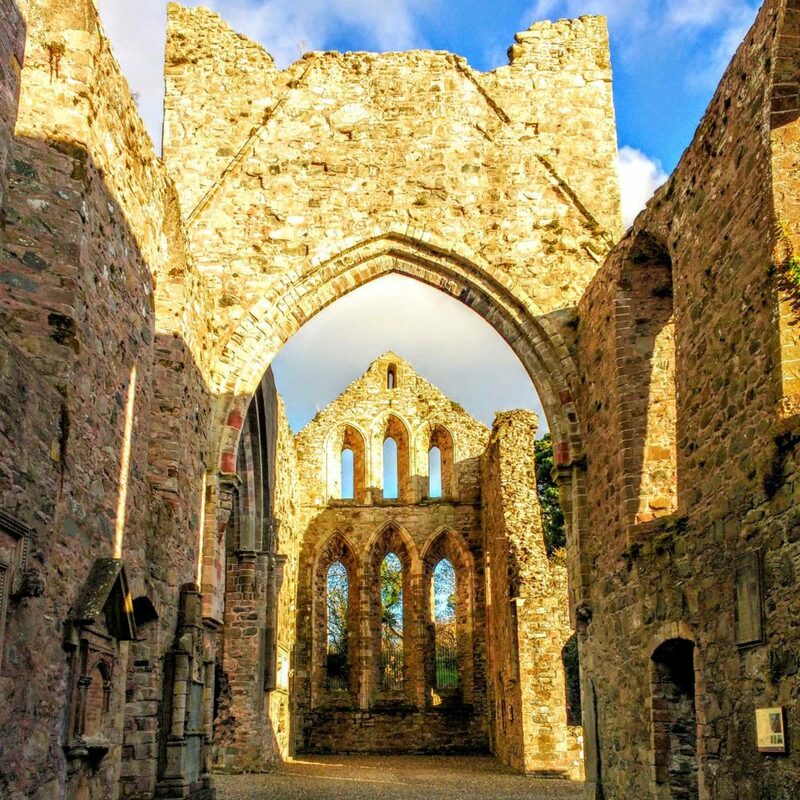 When the Abbey was built, it was named Lugem Dei or the Yoke of God but over time, it became known as Grey Abbey due to the colour of the monk’s robes. Grey Abbey was the first fully gothic style building in Ulster and it was virtually unchanged until the 15th century. When the reformation began in 1541, the abbey was partially destroyed by Sir Brian O’Neill. The Abbey is now in the care of the community and a visitor’s centre has been constructed where you can obtain information about the Abbey, the reconstructed Physic Garden and the small kitchen garden. 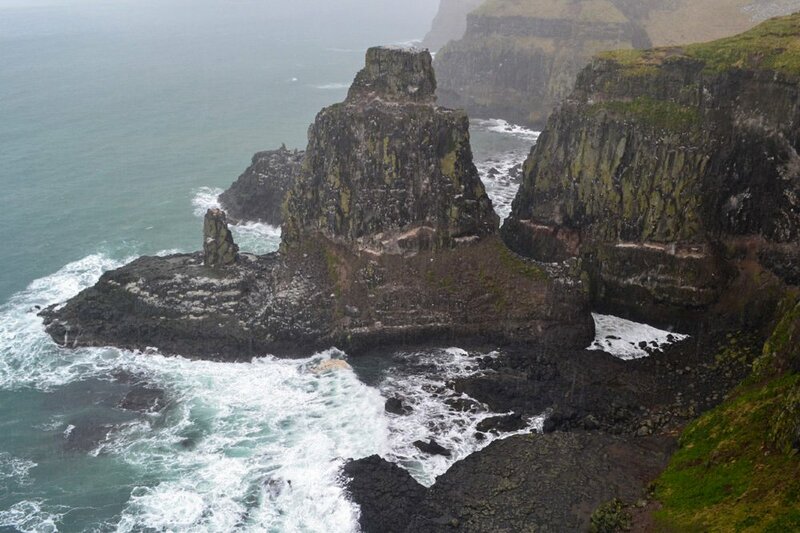 I was drawn to the Antrim coast after hearing about the crazy geology at Giant’s Causeway. Regarding the Giant’s Causeway, there are two competing theories about its origin and you have to choose which version you want to buy into. You can choose to believe that the natural wonder comprised of 40,000 interlocking basalt stones was caused by a volcanic eruption 60 million years ago. Or, you can choose to believe that it was built by Irish giant Finn MacCool, as a way to bridge the North Sea for a fight with the Scots. I’ve chosen to believe the latter and it’s with that sense of wonder that I spent sunrise on the Causeway marveling at it’s perfect geometry. Most people do the Antrim coast as a marathon 1-day bus tour from Belfast but the area is truly best done as a two-day road trip. If you spend the night near the Giant’s Causeway you can visit the national park well before or after the buses leave, allowing you to the privacy to commune with Finn MacCool’s masterpiece. A leisurely drive along the coast will also take you past the Dunluce Castle, Bushmills Distillery and Carrick-a-Rede rope bridge– all of which are on the bus tour. But what isn’t on the bus tour is the opportunity to pull over and take a spontaneous stroll along Whitepark Bay, explore the many Game of Thrones filming sites or to sit in Balintoy Harbour and watch the sunset. So, set aside two days and set out from Belfast with your eyes peeled for giants. The C.S. Lewis pocket park is located in East Belfast and is a little gem in the centre of the community. The square celebrates the life and work of one of Belfast’s most celebrated writers, C.S. Lewis, and contains seven magical bronze Narnia themed art sculptures created by Irish artist Maurice Harron. 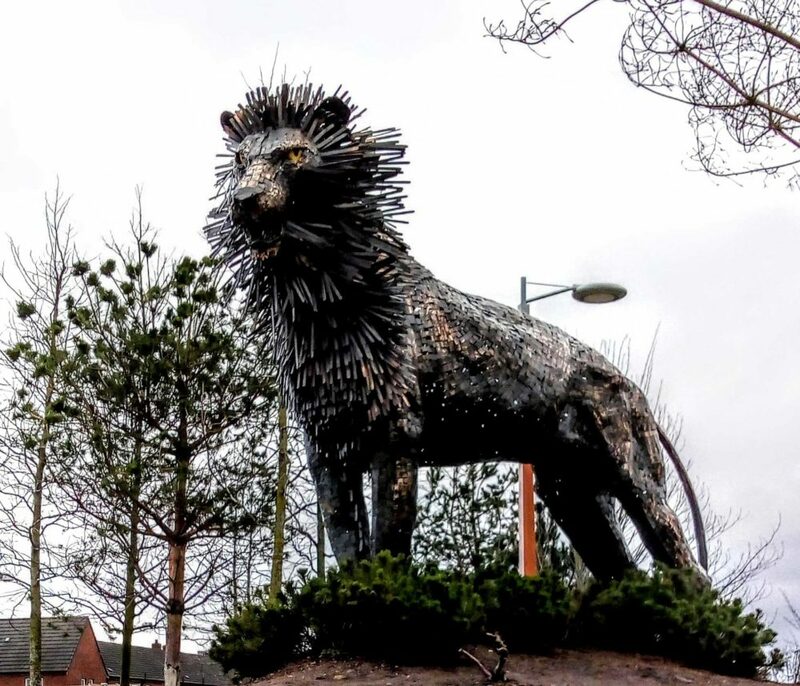 Featuring characters from ‘The Lion, The Witch and The Wardrobe’, they include Aslan, The White Witch, Tumnus, The Beavers, The Robin and The Stone Table, it is a stunning display of public art. There is a Belfast bikes station in the square and you can obtain free trail maps at the Visitor Centre so you can follow the river trails throughout the area. In 2017, a beautifully colourful mural was unveiled on the Eastside Visitors Centre featuring some of the famous inhabitants of East Belfast, from George Best to Van Morrison they are all picture here. Beside the little mural park, you will see a series of newly installed offices and shops built from recycled containers being put into place. The square contains over 200 trees and is a lovely rest stop when touring around Belfast. There is a really nice little cafe in the Visitors Centre where you can get a great cup of coffee and some really good tray bakes and sandwiches. The cafe has a nice offering of both vegan and vegetarian snacks and baked goods; I also have to add here that the staffs are excellent, very well informed and happy to talk forever about the area and of course Narnia. The beautiful lush Tollymore Forest Park was the first state forest park in Northern Ireland, founded in 1955. With over 630 hectares (1600 acres) and its location at the foot of the Mourne Mountains, you can get incredible views of the mountains and nearby ocean. Throughout the park flows the Shimna River, which is a spawning ground for salmon and trout. The river is crossed by 16 bridges, of which the earliest dates back to the year 1726! At Tollymore, there are plenty of grotto’s and caves to discover. And did you know that they use oak wood from this forest to decorate the interior of the White Star Liners that were built in Belfast, including the Titanic? If you are a Game of Thrones fan, you will recognize the park in season 1, episode 1 as the place where a party from the “Night’s Watch” first meet the “White Walkers”. In the same episode, you can see Ned Stark and the boys coming across a stag that has been gored and they find a dead direwolf with several pups next to the river. 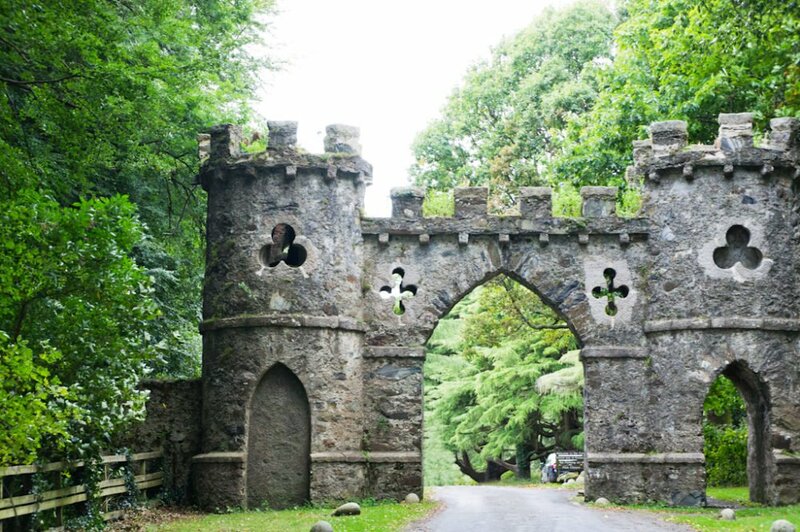 Whether you’re a “Thronie”, or just like hiking, camping, horse riding, cycling and/or enjoying a picnic, Tollymore is there to enjoy for everyone. The park is open daily from 10 AM to sunset. P.S: As you have seen, I have added tours here for you. I personally love GetYourGuide and use them regularly for my own tours. They are quite new but great, so definitely a good choice for booking tours (Viator is also a good option). However, since I have never been to Northern Ireland myself these are tips I have added after doing proper research. Enjoy!